Need new drill bitz first. I keep snapping them. bad luck. Its not bad luck so much as all the really thin drill bitz being made way too long for no reason. Some hobby company should be making them like 1cm long so they have less flex. I've mounted 10 Orks to 10 of the new bases. Here's what that looks like. 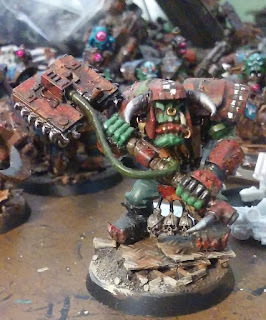 I need to be a bit more careful when I build out more bases and keep in mind where the Orks feet will go so they fit the bases a little better. But it's a good start. Just need to do a bit of drybrushing on the boots to dirty them up so they look right. I've been thinking a bout that too. Not too difficult really I was excited to layer the stuff up But I also have some that are just plate metal and dirt that are mostly flat. 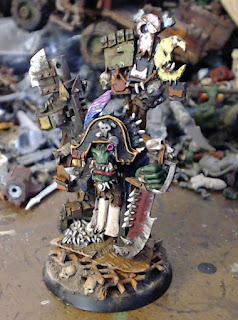 I had been thinking if it looked too wobblie I could save those ones for grots, which have a smaller leg base to worry about. Should work. Update. About a week later I've constructed about 120 bases. I wasn't even is a rush. No pictures today but there will be pictures. I'm taking a bit of a brake and should be back to it in a few days. If I can keep this rate I'll be done in months instead of a year! At this point I have done up over 200 bases. Here's another sampling. 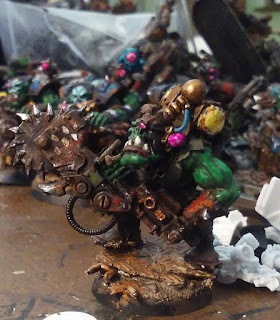 MY other table space is littered with Orks on bases all fancy'd up. I need to put them away and make room for more. 90 slugga boys, 90 shoota boys (Shoota boys will probably be in the next wave.) 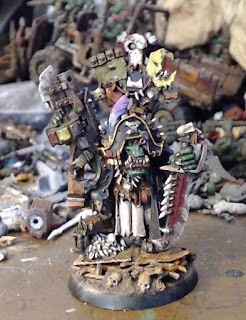 60 grots (the current new plastics.) And lot and lots of other stuff. I've set a lot aside to sell and trade away but haven't taken the time to get to it. Meh. I'll get too it. I think you have struck the perfect balance. The bases add to the figures without being a distraction. And, as Badfang pointed out, the staying balanced is no longer an issue. 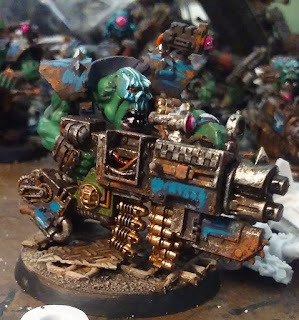 Not sure if Orks care, or are concerned about that last one. Well done!! I know the first few I posted were a little strange looking but I think mostly that was due to the angle of the base in the picture. But I've come a long way in a few weeks and can fix the strange bases later when I get another coffee straw and a little more odd bitz to work with. If I make a display base, not very likely..., I'll have matching junk piles so it will all come together. I'm pausing the bases project until I finish my next 2 beakie models which finally arrived. I'll be back at Ork projects no later than May 1st. B&C's ETL starts and I am planning to build and paint 10 more flash gitz, the boxes just arrived a few days ago. I'm looking forward to getting to those! Good bases. There's all the detail there if you choose to look at it, but the muted colour scheme keeps them from strealing attention from da boyz. I just posted my ETL vow over at the B&C, seems I participate in that event every year for a few years running now. 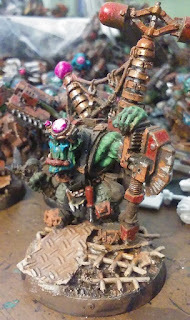 "I, warhead01, representing that majestic bundle of violence affectionately known as WAAAAGH GorGak! 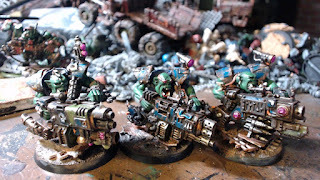 Do here by swear this vow, both foul and malicious, to complete the following units for the glory of representing Da Orks in this years ETL. Should I fail, blah, blah, blah, Banner of shame the rest of the year, blah, blah, blah. " I'll update here with my progress. No reason not to post pictures of this stuff after all. I just updated my blog with pictures of these. Already getting started. 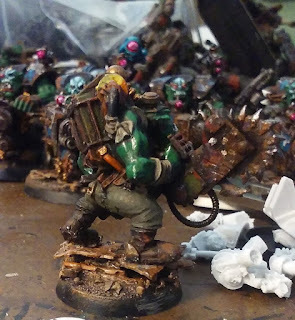 Priming one of the trukks. The ETL is a yearly painting challenge on the Bolter and Chainsword. 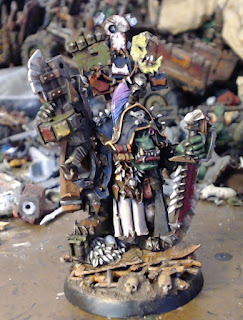 The Ork subforum is still very small. Each subforum has an ETL HQ. So we can get out efforts together. Have a read if you want. I love that model. You've done a damn good job of him. The feather in his hat is particularly impressive. I love that model. You've done a dread good job of him. The feather in his hat is particularly impressive. The bottles are bigger than the standard GW pots, 2fo, (60Ml) They last forever if your just using a little here and there. I recommend these and the Flourescent colors as well. I've just updated my blog. I've hit my stopping point on all the models I did Vow for the B&C's ETL. I know I don't update as often as I used to. I'm spending more time over on the B&C right now. 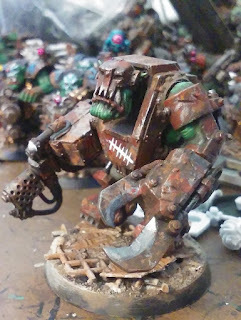 GorGak had put his mek pit back into gear with instructions to his Mek Boss. "Oi"!! Get something done over there! Or your a panzy git!" Not to take that sitting down, Bumpy knuckles "Mek Boss extraordinare" had the chairs thrown out and began cracking the whip and barking orders. His confused grots not wanting to stay late again hopped back to their work! Like Santa's minions from before old night they hummed the insane songs of the enslave workers as they made weapons of mass destruction for the bosses ....in this case they would be the bosses! "You can't treat us this way! w may be grots but we has rights! " This would produce a plethora of Killa kans that the committee believed would bring them to freedom! Or at least impress the Boss enough to give them some time off at a future date yet to be determined! Huzzah! Real bargaining power would at last be theirs! 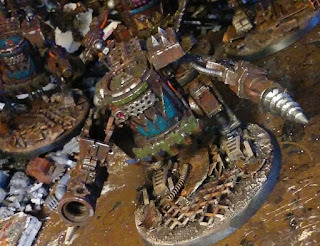 I actually managed to get 9 Killa Kans I have had set aside for a few years, started but kinda far along, finished..or at least to a happy stopping point. I woulda, shoulda, stuck these in a ETL Vow but I really thought they were a bit too far along and I usually Vow models that are only assembled and primerer at most. Hope you enjoyed the little happening above. haha. Silly little gorts have BIG dreams.